We are a family operated group of farms located in Central Pennsylvania. Our products range from organic produce to market lambs. Organic heirloom gourmet pie pumpkins, kobacha, acorn squash and jack-o-lanterns from September through December available by mail order or at the farm. Produce by appointment through Don Spackman at 814-692-8432. (advanced orders/contracts appreciated.) Potato varieties include yukon gold and red chieftain suitable for baking, frying, mashing and creative uses. Our organic produce is available direct from the farm or through an organic produce Co-op. Contact us for more information or check out http://organicpiepumpkins.blogspot.com/ . Pie Pumpkin Crop and the picking crew! 4H Club Lambs and Freezer lambs for sale in spring and early summer. 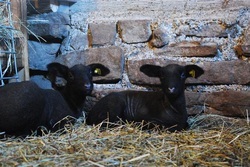 For lamb information contact Jeff Spackman at 814-692-7092. Click on the Show Ring Success page for more information. The 2016 Roundtop Farms team had five of the eight lambs in the drive for Grand Champion at the Centre County Grange Fair! Our lamb genetics come from some of the Mid-Atlantic's top breeders who base their flocks on some of the nation's elite producers. Blood lines include Myers View Farm, G&G Club Lambs, Pleiman Club Lambs (Ohio), Beatty Club Lambs and Thurston Club Lambs (Maryland). These blood lines go back to Hindman, Johnson, Marx, Ott and Rule.